Cite page (MLA): Ward, Megan, and Adrian S. Wisnicki. "Field Diary XVII: An Overview." In Livingstone's Final Manuscripts (1865-1873). Megan Ward and Adrian S. Wisnicki, dirs. Livingstone Online. Adrian S. Wisnicki and Megan Ward, dirs. University of Maryland Libraries, 2018. Web. http://livingstoneonline.org/uuid/node/f14df138-9618-48a7-967e-c9122d79add2. This page introduces Field Diary XVII, which is part of our critical edition of Livingstone's final manuscripts (1865-73). The essay describes the final entries made at the end of Livingstone's life. The essay also examines the form of the diary and ends by outlining the note written in the diary after Livingstone's death by his attendant, Jacob Wainwright. Field Diary XVII – just 32 pages long – chronicles the eighteen days leading up to Livingstone’s death. In the opening pages he writes that he is “pale bloodless and weak from bleeding profusely ever since the 31st March,” but notes that he still wishes to continue: “Oh how I long to be permitted by the Overpower to finish my work” (Livingstone 1873b:). He continues to hope for a recovery, believing that his illness may be fever and dosing himself with quinine. The Last Mile of Livingstone's Travels. Illustration from the Last Journals (Livingstone 1874,2:opposite 295). Courtesy of Internet Archive. Yet continued bleeding leaves him extremely weak, first able to walk for only an hour or two and finally unable to move at all, even when carried. Written in shaky handwriting, his last entry remains hopeful: “knocked up quite and remain = recover sent to buy milch goats - We are on the banks of R[iver] Molilamo” (Livingstone 1873b:). These last entries show that the problems Livingstone recorded in Field Diary XVI persist: geographical confusion and difficult interactions with the local populations. 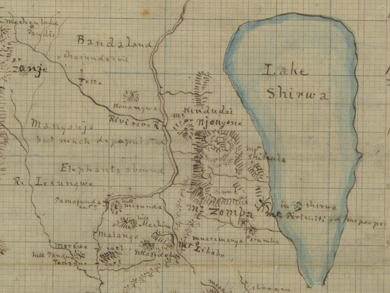 Livingstone continues around Lake Bangweolo, but due to bad measurements, he is mistaken about the lake’s position, an error compounded by the lake’s marshy edge: “it is quite impossible at present to tell where land ends & Lake begins” (Livingstone 1873b:). (Left; top in mobile) An image of a page of Field Diary XVII (Livingstone 1873b:). Copyright David Livingstone Centre. Creative Commons Attribution-NonCommercial 3.0 Unported. (Right; bottom) Autograph Facsimile of Last Entry in Livingstone's Note Book. Illustration from the Last Journals (Livingstone 1874,2:between 298 and 299). Courtesy of Internet Archive. These images present the final page of Field Diary XVII with text from Livingstone in two versions (original and printed facsimile) and together reveal the material information lost in the otherwise fairly straightforward and unadulterated published textual facsimile. Livingstone also encounters continued resistance from the locals, who believe he stole the canoes he is using, though he insists that he paid for them. Local fisherman refuse to give directions, and he records “fear in all the inhabitants” that makes it difficult to interact (Livingstone 1873b:). Till the end of his life, Livingstone continues to make detailed scientific measurements and records observations on botany, ecology, and local culture. The few pages of this diary include descriptions of subaqueous plants, fish anatomy, and local methods for catching fish. Images of two pages of Field Diary XVII (Livingstone 1873b:, ). Copyright David Livingstone Centre. Creative Commons Attribution-NonCommercial 3.0 Unported. These images present (left; top in mobile) the text from Jacob Wainwright that follows Livingstone's last set of dated entries in Field Diary XVII and (right; bottom) the final sequential page of the diary, which contains a variety of random observations and which Livingstone most likely wrote prior to composing the final dated entries. Reference to the original manuscript thus reveals an authorial and material configuration more complex than that suggested by the textual facsimiles published in the Last Journals (see Livingstone 1874,2:between 298 and 299, and above). Field Diary XVII is the same kind of book Livingstone used for Field Diaries XV and XVI: black, with a flip top, and a metal clasp at the bottom. It measures 159 mm high by 92 mm wide by 16 mm thick, and the Stirling University conservation note records that it contained a “pencil so short Livingstone had to cobble something together to help him grasp it” (Livingstone 1873b:). The page immediately following Livingstone’s final entry records a note by Jacob Wainwright, one of Livingstone’s long-time porters. It records the date and time on which Livingstone presumably passed away and outlines the contents of Livingstone’s box. Given Livingstone’s dependence on his porters, as well as his sometimes-troubled relationship with them, it seems fitting that, in the last field diary, Wainwright inscribes the final entry.